Email marketing is an interesting animal. It has often been compared to direct mail. However, unlike direct mail, sending irrelevant and even annoying messages can really burn your entire email marketing program. With direct mail, if a recipient didn’t like your message, they can drop it straight in the recycling bin. However, with email marketing, your email recipients can affect your ability to reach other potential customers by, for example, marking your email as spam. Brutal. Q: Which of the following tactics is your organization using to improve email deliverability rates? Please select all that apply. When is a subscriber an inactive subscriber? For people who remove inactive subscribers, typically, how long should they be inactive for? This is a great question, Ariel. It is the marketing equivalent of “What is the meaning of life?” on some levels. Because, I’d say – to both questions – the answer varies. For example, how long is your sales cycle? How frequently do you send email? Can you tell if these folks are engaging with your company in other ways? How segmented are your email sends? Do you send triggered emails? Whatever the length, it is probably worthwhile to consider a re-engagement campaign before removing these inactive subscribers. But, answering a question with more questions is a wholly unfulfilling answer, I readily admit. So, to give you some straightforward numbers to chew on, I did a quick dive into the MarketingSherpa Library to see how some companies define inactive subscriber. Eventful, an event Web service, considered subscribers inactive if they had not engaged with an email for five months – Email Marketing: Weekly newsletter sees 400% lift in reactivation of inactive subscribers with personalization. TBC Corporation, which owns automobile parts and tires businesses like Midas and Tire Kingdom, considered subscribers inactive if they had not opened or clicked an email in six months or longer – Email Marketing: Delivery rate increases from 60% to 99% by separating inactive subscribers. CNET tracks inactivity at different levels. People who hadn’t opened an email in the last 60 days, 120 days, and 180 days, for example, and then engages in a re-engagement campaign based on these levels of inactivity before removing inactive subscribers – Email Marketing: CNET win-back campaign sees 8% subscriber re-engagement. For the most drastic campaign in this area, Indianapolis Symphony Orchestra sent a re-engagement email to everyone on the list (including active subscribers), and removed all subscribers who didn’t click “yes” they wanted to continue subscribing – How Cutting a House List 95% Helped Double Sales: 5 steps. I’d be interested to see open/ROI rates of video marketing efforts versus text and pictures. Do you have any research available on this topic? We do not have any research available yet, and I do not know of any in the industry, Rikki. However, here is a case study about a marketer who increased conversions more than 50% by embedding video in emails – Embedded Video Lifts Conversion Rate 50%: 5 Steps to Test Deliverability & Subject Line. 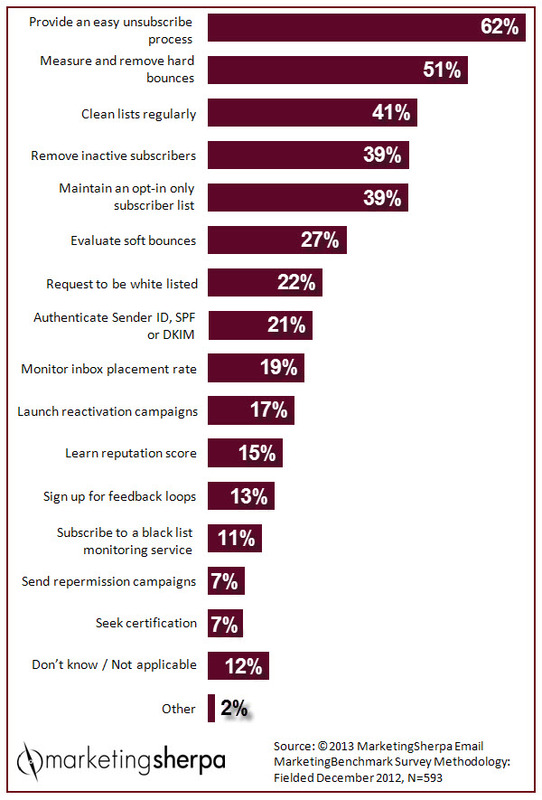 I was surprised that only 39% report maintaining an opt-in only subscriber list. Apparently, with the easy unsubscribe process being the number one tactic for improving deliverability; marketers are using an opt-out strategy more than they are using opt-in to build their lists. This may work if there is a close relationship with the subscriber via other channels, and if they are proving email value right away. Excellent post. Deliverability is also something I’m concerned about. Deliver-ability is always a concern but a bigger concern is the fact that at anytime, anyone can mark you as SPAM, and we all know that SPAM, no matter how you slice it, is never good. All kidding aside, this can really damage your reputation and hinder your marketing efforts. A double opt-in is the smartest way to proceed. Love this post. If you do nothing else…. DO THIS! If you ever wondered while reading articles “Does this relate to me?” YES!!! THIS DOES! I like the optimism, but I’m afraid the 62% opt-out vs 39% opt-in just proves that the majority of email marketing is spam and it is still possible for most marketers to get away with it without any major deliverability problems. I would never condone spamming but the fact is that a polite, high quality, well targeted campaign to a non opt-in list can still get sales and won’t trigger too many spam complaints. Great advice on creating a re-engagement campaign before unsubscribing inactive users. There are lots of ways to rejuvenate interest in your email marketing (including personalization), so before you consider subscribers lost forever, try to shake things up a bit. Content above all else, even opt-in vs opt-out status, will determine success. Our focus is B2B deployments to purchased lists and we have clients with 15-20% open rates and similarly impressive CTRs. It certainly helps to respect your recipients time, by giving them the chance to opt-out BEFORE sending them promotional emails. Keeping them engaged by making sure your message is relevant and a little personal touch goes a long way.